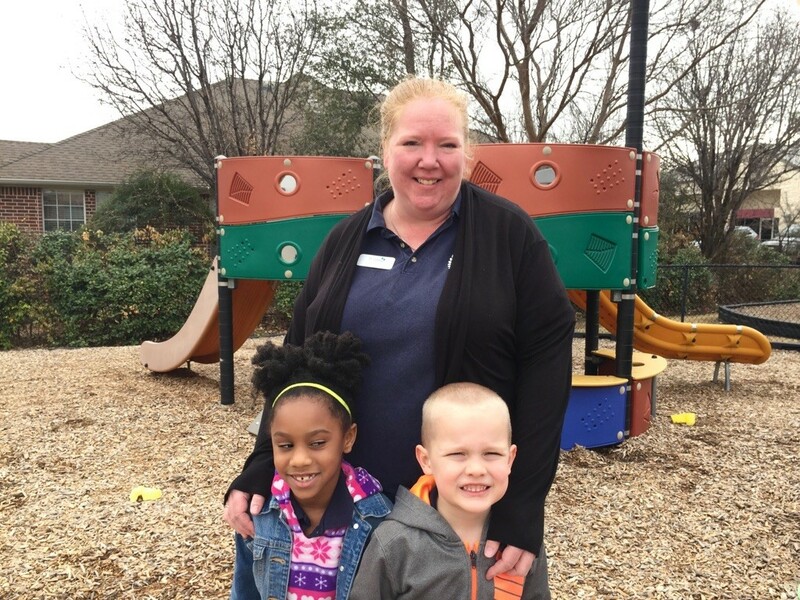 Ms. Daniele is the lead pre-kindergarten teacher at The Children’s Courtyard in Southlake, TX. She has been at The Children’s Courtyard since 2015, but has 20 years of experience in early childhood education! Read our Q&A with Daniele to learn more about her background and passion for early education. I had not been around children until I had one. I worked in an office and then was a stay at home mom for the first four years. I wanted to find a great pre-k for my son so I shopped around and I couldn’t find anything that was quality and clean. Finally, I found a great place, but I couldn’t afford the tuition. So they said, “Well, we need an assistant in the three-year-old classroom and that would cover your tuition.” So I said “That sounds great!” It was a lovely place and there were nice people and it was clean. The next year I moved up to assistant teacher in pre-k. I started taking some childhood education classes and I found it was something I really enjoyed. My son is 19 now and he’s in college, and he actually works in the school-age building across from us! Yeah, sometimes he comes into my classroom to do my job while I go on my lunch break. So he works in the school-age classroom in the evening and takes all his college classes in the morning. It’s really nice! Just watching the children grow and knowing that I’m giving them something to make kindergarten easier. How to you ensure that you have strong communication between yourself and your families? Brightwheel is fabulous because we can send notes. All of my parents are connected on there. And so we send notes every day about something we’ve done. I try to spend as much time as I can interacting with them at drop off and pick up. I want to make sure everybody knows that conferences aren’t just once or twice a year – I’m always here to talk. What have you enjoyed about working at The Children’s Courtyard? I like the flexibility to take this giant amount of curriculum and make it into what fits each child the best. It’s not a rigorous, monotonous, repetitive curriculum. And if I need something from management, I can ask, and they’ll provide me with whatever I need within reason. I appreciate the support that our management is able to give to teachers. They’re really great. I like to read. And my husband and my son love to watch movies so we watch movies together. We like to go camping, I like to be outside and enjoy the weather when the weather’s nice. Is there a memorable moment that you’d like to share from your time at CCY? A little boy in my class, he started here pretty much non-verbal. He’s on the spectrum, but he wasn’t communicating effectively. He had learned to read, and one day during circle time he raised his hand and asked if he could read his books that he brought from home. His voice wasn’t loud enough that we could hear him the first time, but the second time he did it, we could hear what he was saying. It was pretty amazing. I got to record it on my iPad to show his parents and it was very touching to them too. It was a pretty incredible moment. He felt comfortable enough in our environment to do that. It was something he knew he could do and he asked to do it. It was pretty cool.